EXPECTATIONS were high that the logistics sector would benefit from the booming online shopping trend in Malaysia in the past few years. But despite Alibaba Group Holding Ltd setting up its first regional logistics hub outside China in Sepang’s Digital Free Trade Zone at the end of 2017, local logistics players, particularly those involved in the last-mile delivery, seem to have lost their lustre to investors. The worst-hit are Pos Malaysia Bhd, GD Express Carrier Bhd (GDeX), CJ Century Logistics Holdings Bhd and Tiong Nam Logistics Holdings Bhd. Of the four, Pos Malaysia saw the biggest decline over the last one year, falling 61.6% to close at RM1.92 last Thursday. GDeX slid 49.6% to 31.5 sen while CJ Century and Tiong Nam lost 53% and 41.9% to close at 46 sen and 75 sen respectively in the same period. This is in stark contrast to the strong upward trend in the share prices of logistics players from 2016 to 2017. Analysts attribute the loss in investor interest to disappointment over the weaker earnings of logistic players in a highly competitive market. Pos Malaysia, the market leader in the domestic parcel delivery segment, posted its first quarterly loss in a decade of RM16.58 million in its second quarter ended Sept 30, 2018 (2QFY2019). It had recorded a net profit of RM18.83 million a year ago. 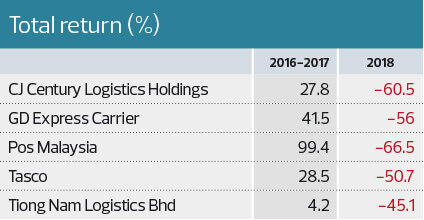 While Pos Malaysia’s growth in the courier segment is not sufficient to offset losses in its snail-mail business, GDeX is struggling to turn its higher volume of parcel deliveries into better earnings. In its first quarter ended Sept 30, 2018 (1QFY2019), net profit fell 18% year on year to RM6.47 million, mainly due to expenses incurred for warehouse expansion during the period. This was despite an improvement in its courier services as revenue and profit before tax rose 8.4% and 11% to RM72.7 million and RM10 million respectively in the same period, thanks to increased demand. In its second quarter ended Sept 30, 2018 (2QFY2019), Tiong Nam saw its net profit tumble 82.4% year on year to RM2.22 million. The company’s e-commerce delivery segment, Instant, which was set up in 2017, is expected to remain in the red in FY2019. In its third quarter ended Sept 30, 2018 (3QFY2018), CJ Century, which just began its courier business, saw its net profit slip to RM3.72 million from RM3.86 million in the previous corresponding period. This was because of ongoing costs incurred by the expansion of its courier business during the quarter. It is worth noting that the courier business posted a loss of RM4.9 million despite recording revenue of RM5.83 million. MIDF Research analyst Adam Mohamed Rahim tells The Edge that the disappointing earnings were due to intensifying price competition following the emergence of logistics start-ups. Hong Kong-based Lalamove, GogoVan and Pickup and Singapore-based Ezyhaul and Ninja Van are but a few of the foreign logistic players that have entered the local market. “While volume is growing for last-mile delivery players such as GDeX, the delivery fees will have to be lowered to remain competitive with the start-ups entering the space,” says Adam. According to data provided by the Malaysian Communications and Multimedia Commission, the number of courier licences issued rose 45.5% to 128 in 2017 from 88 in 2015. The MCMC oversees and regulates postal and courier services in Malaysia. Adam opines that the competition in the parcel delivery space has given online shopping platforms such as Lazada, Shopee and Zalora an advantage in negotiating better terms with the logistics players. An analyst with a foreign brokerage firm agrees, pointing out that a number of the start-ups price their delivery services at very competitive levels, even to the point of making a loss. “These start-ups don’t mind losing money in order to gain market share as they can raise funds. For example, if you look at Ninja Van, a Singapore-based company with a regional presence, it recently raised at least US$87 million in funding, making it one of the most well-funded logistics start-ups in Southeast Asia. How do you expect the public-listed logistics players to compete on pricing? They have their annual reports and quarterly reports to show their bottom line,” he says, adding that this has deterred investors from buying into listed logistic players. Another reason for the lack of investor interest in the logistics sector is high valuation. For example, GDeX is trading at a trailing price-earnings ratio of 76.8 times while Pos Malaysia has a PER of about 60 times. This is despite the recent sharp decline in their share prices. CJ Century and Tiong Nam are trading at a trailing PER of 14.3 times and 12.5 times respectively. “High valuation is just one of the reasons; investors are also wary of the thin margins for last-mile delivery amid the strong competition. And while e-commerce grows, a lot of the consumers will use a delivery service they are already familiar with,” says Danny Wong, CEO at fund management company Areca Capital Sdn Bhd. He adds that the infrastructure must also be available as e-commerce players prefer to use services that are efficient, given the short time to deliver. MIDF’s Adam says he is neutral on the logistics sector despite the selldown in the share prices because most of the issues faced by the industry have not been resolved. He adds that more developments and updates on Sepang’s Digital Free Trade Zone could boost logistics players as the direction of the e-commerce space will be clearer. According to Adam, Tasco Bhd is a logistics player that has not jumped on the last-mile delivery bandwagon but has instead embarked on the cold chain business. Tasco has also formed a joint venture with Yee Lee Corp Bhd to provide it with logistics and warehousing services. Yee Lee owns an extensive trading business and is a major shareholder of Spritzer Bhd. The JV will provide inventory management, warehousing and logistics services to petrol kiosks, convenience stores and food and beverage outlets, among others. It is worth noting that following the acquisition of the cold chain business last year, Tasco commands 80% of the domestic ice-cream delivery market. Nevertheless, its share price was down 38.5% from a year ago at its RM1.26 close last Thursday. Like Adam, most analysts are neutral on the logistics sector this year. However, the share prices of most of the players have recovered somewhat since the beginning of the year. Tasco, which had closed at RM1 on Dec 31, had risen 26% as at last Thursday while GDeX, Pos Malaysia, CJ Century and Tiong Nam had climbed 18.9%, 11.6%, 17.9% and 2.04% respectively. A fund manager says the share price recovery was in line with the improving market but doubts that investors will become excited about logistics players. This is because of the stiff price competition despite the huge increase in e-commerce activity. According to Areca Capital’s Wong, as the market leader in the domestic parcel delivery segment, Pos Malaysia has an advantage over the others, given its existing infrastructure, although there is room for improvement in its efficiency.